What a journey! Painting cabinets has never been my forte but, if you’re like me, you’d learn how to paint what ever you needed to paint to get some relief from the darkness. 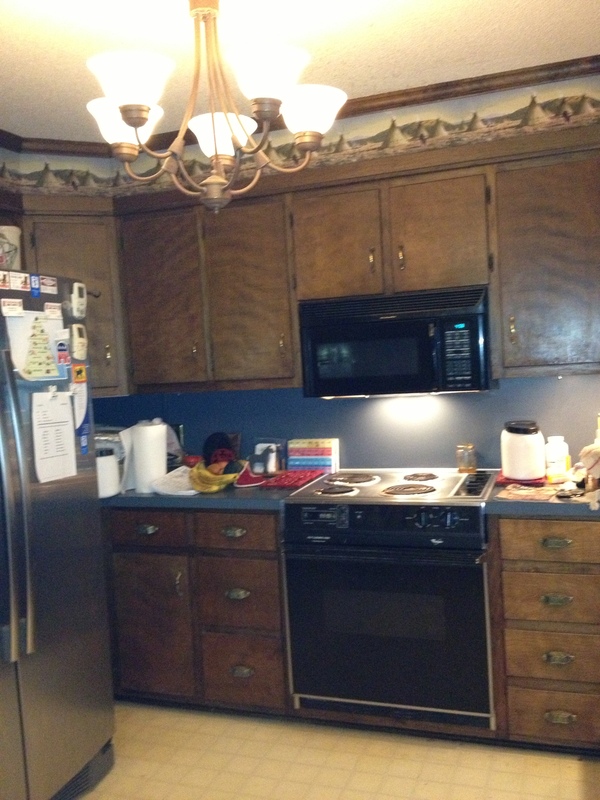 Dark doors, dark window trim, dark cove molding, dark base boards, and all dark wood cabinets … dark wood EVERYWHERE. Sounds simple to change, doesn’t it. Well, there’s a glitch. As with many husbands, mine is no exception, he wants/likes the all natural wood look. REALLY? “It’s dark in here,” she said. “Yes, but it’s natural wood,” he said. “The wood is a cheap Philippine mahogany stained with a dark walnut finish,” she said. “Yes, but it’s natural wood,” she said. 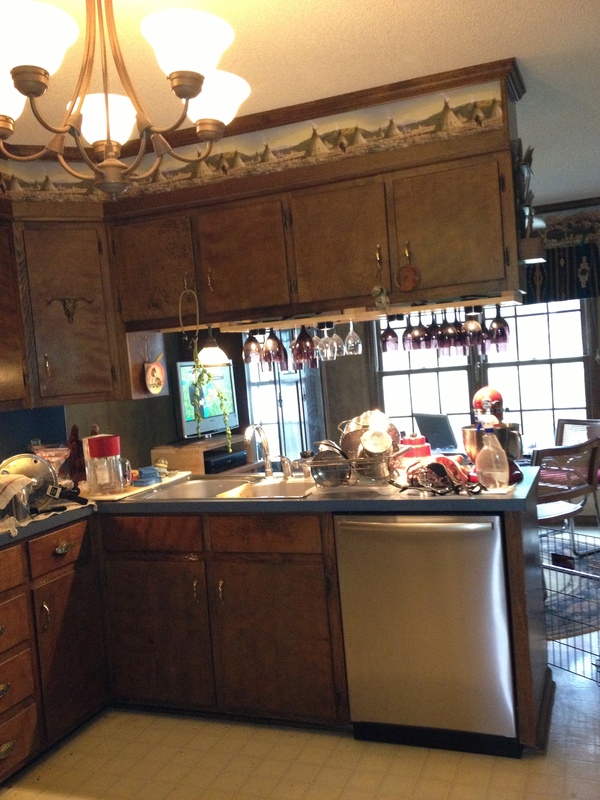 Below are photos of what our kitchen looked like. Dark, dark, dark, dark, dark … . Ugh … . Well … … … . 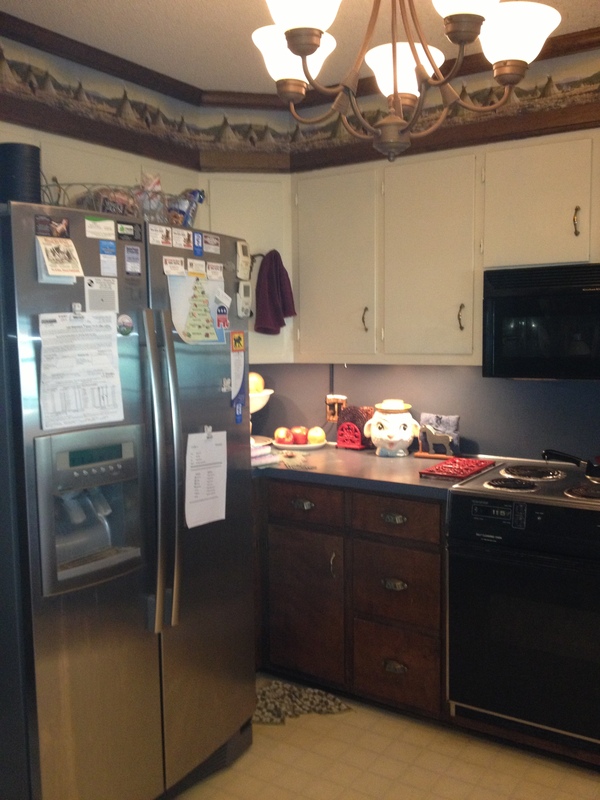 The first time I saw a kitchen where the upper cabinets were painted one color and the bottom cabinets were painted a different color, I knew what to do. I started talking about how wonderful that contrast was and how contemporary it looked. 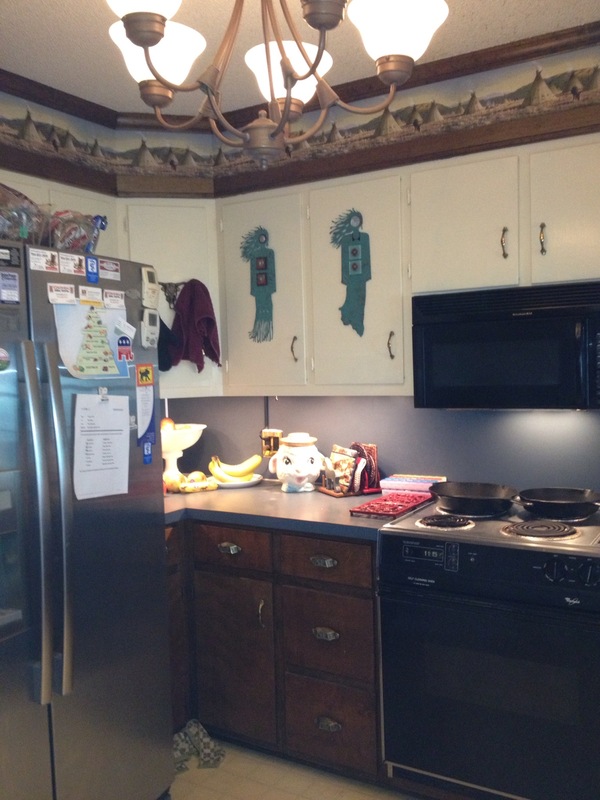 For months, I showed himself pictures of different designs with these two contrasting cabinets. “It’s the latest thing,” I said. “Hummm … ,” he said. Hallelujah! After weeks/months of prompting, it worked. Over the July 4th holiday, he and I painted the upper cabinets a delightful pale yellow color that blended well with the wall covering. It is beautiful and so light and refreshing. Here’s what our kitchen looks like now. AND … We’ve been able to get our Spirit Woman collection out of a box and put them where we can enjoy them every day. After all, living with them is why we bought these ladies. 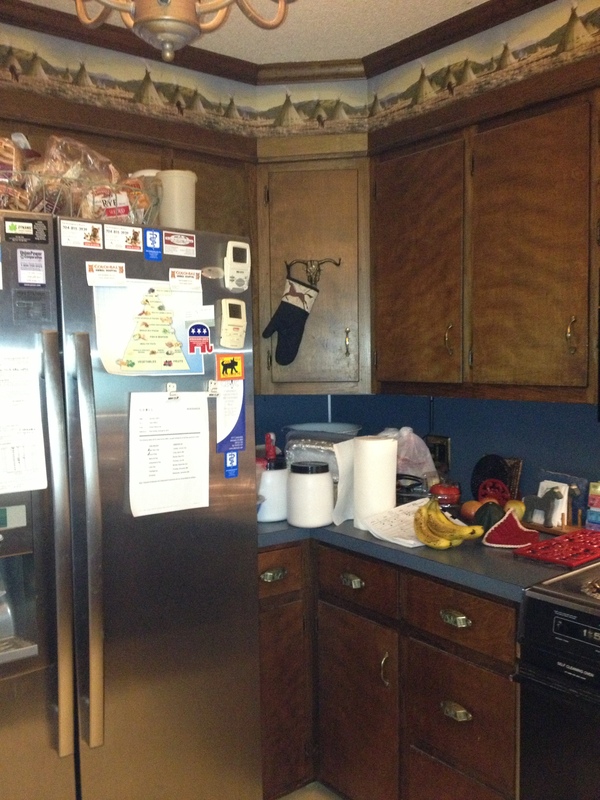 I’m not sure about these contrasting cabinets after living with them for a few weeks. 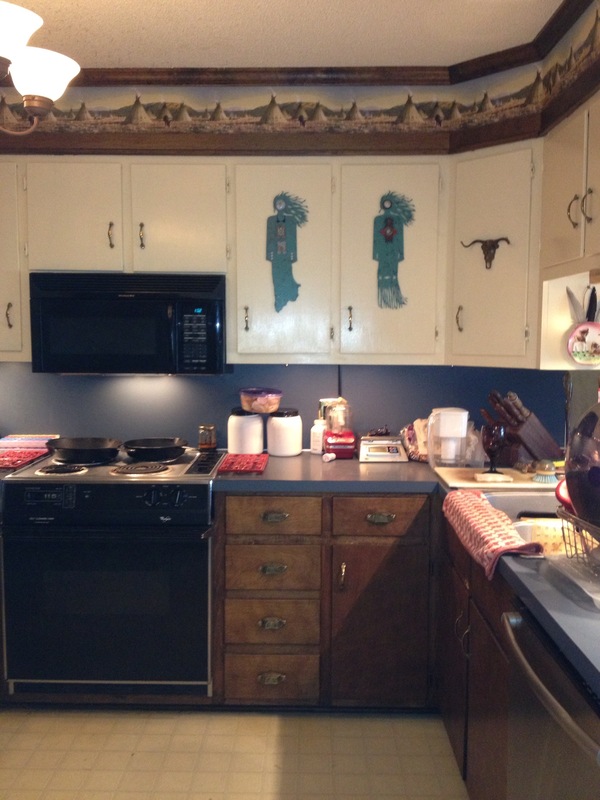 Maybe we should go ahead and paint the bottom cabinets to match. What do you think?